Steve Jobs. Bill Gates. Mark Zuckerberg. These three have paved the way for budding tech entrepreneurs through their innovations and technologies. Working as a tech entrepreneur is now more attainable through their inspiration and all the innovations available to us today. Technology entrepreneurship provides innovations and developments through services or products that use technological advances like websites, gadgets, and apps. This venture is the next step in modern day entrepreneurship and is truly something worth considering. In today’s edition of Five Tips Tuesday, we’ll help you become an awesome tech entrepreneur. 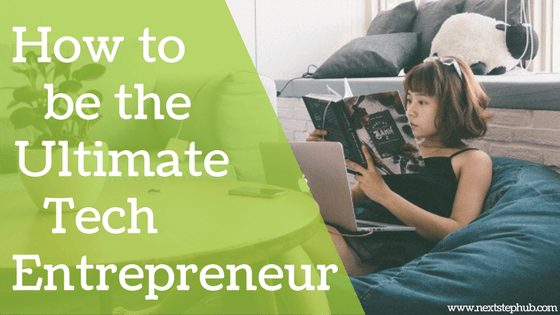 Discover the traits that you need to develop to become a great tech entrepreneur. Learn about the tools your company needs for a smoother tech startup. Hear all about the success stories of different young entrepreneurs in the digital world. Accelerate the growth of your business by using a handy infographic. Lastly, get a book that can give some promising business ideas by studying different trends in the tech world. Before anything else, you should have the right mindset so that you can efficiently proceed with your technology start-up. Approaching this venture with the right state of mind can make things easier for you down the line. This blog can help you steer your company in the right direction and help you become a successful entrepreneur. Now that you have the right mindset for your new business, it’s time to get cracking and do the work for your startup. Time is one of your most valuable assets when you embark on your journey as a tech entrepreneur. That’s why it’s vital that you have tools at your disposal that can increase productivity and help shave valuable hours off your day. Here are some tools that can help increase productivity when you work on your tech startup. Experience is the best teacher when you’re starting a new business, so it’s important to learn as much as you can from whoever you can. You must make it a habit to continuously learn about your craft and field so you can improve your skills, even your products. One best practice is to study people that have walked the same path and learn from their stories. Follow them and learn from their habits and mindsets so that you can apply them to your tech entrepreneurship. Innovation and vision are important to become a tech entrepreneur. But in reality, these things are not enough. Tech entrepreneurship requires excellent skills in order to build a valuable product. The good news is, these abilities are learnable and attainable. Check out this infographic to find out the skills and traits you need to be a successful tech entrepreneur. When creating a product or service, longevity is a factor that you must consider. Nir Eyal’s “Hooked: How to Build Habit-Forming Products” explains why some products capture widespread attention. He also emphasized the “Hook Model”, a four-step process that big companies use to subtly encourage customer behavior. Based on Eyal’s years of research, consulting, and experience, this book is ideal for tech startup founders, marketers, and designers. Do you have other tips that can help tech entrepreneurs thrive? Let us know in the comments!